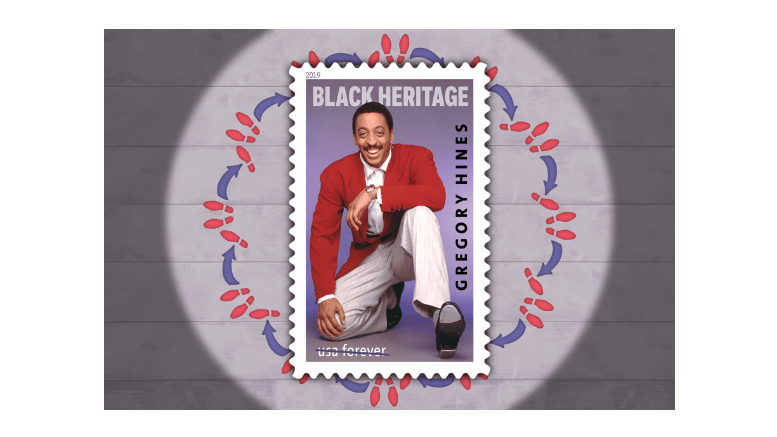 January 25, 2019 — Gregory Hines is dancing his way onto America’s mail. The Postal Service will release a stamp Monday, Jan. 28, honoring Hines (1946-2003), the beloved tap dancer who also made a name for himself as an actor and singer. He will appear on the 42nd Black Heritage stamp, which USPS will dedicate Jan. 28 during a ceremony in New York City. Hines’ unique style of tap dancing exposed new audiences to tap and renewed interest in the art form during the 1990s. He was a versatile performer who appeared on Broadway and television and in movies. He won a Tony Award in 1992 for his starring role in “Jelly’s Last Jam,” hosted an Emmy-winning PBS series about tap dancing and recorded a No. 1 R&B duet with Luther Vandross. Derry Noyes, a USPS art director, designed the stamp, which features a photograph taken by Jack Mitchell in 1988. It shows a smiling Hines on one knee in a red blazer and gray pants, with one foot raised to show the taps on the bottom of his shoe. The stamp will be available at Post Offices and usps.com.